The long, sweeping bend I take is covered in a fine coating of debris, which suggests that the region has just had the last of its April rain. Overhead, the sun blazes in a baby blue sky, the thin mountain air strengthening its UV rays so the goggles attached to my angular Shark motorcycle helmet have to work twice as hard to prevent me from squinting. 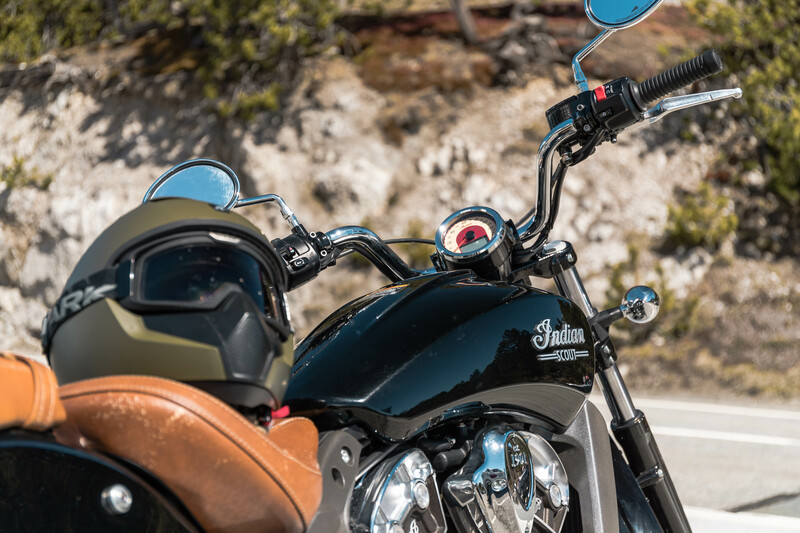 I kick the Indian Scout down a gear, tip its squat frame into the open right-hander, drop a foot off the pegs to prevent metal striking the road surface and throttle through the corner. The bike feels surprisingly light and agile, with its low centre of gravity offering plenty of feedback to the rider. 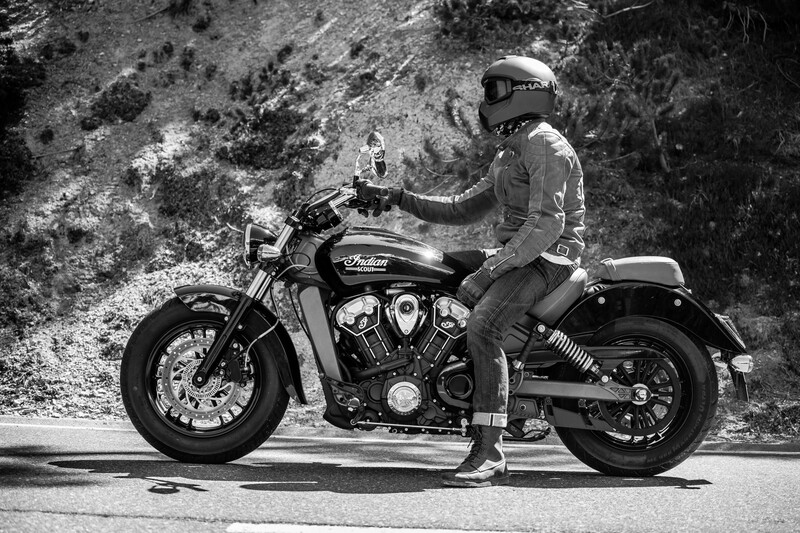 Only the occasional scrape of a footpeg serves as a gentle reminder that this machine was built for cruising. I cross the dusty lines on the road and take a wide approach to the next bend. This particular snaking mountain pass remains closed to the general public for the next few days, so I can rest assured that I won’t meet any oncoming traffic. It allows me to use the entire road, taking corners at greater speed than usual and linking bends together like a hill-climber. A few curves later, the Umbrail Pass crests a peak and the scenery suddenly opens up, revealing pristine white snow-capped mountaintops that contrast with the piercing blue skies. I pull over, kill the throttle and take some time out to catch my breath and collect my thoughts. The bike may bark and shout but among this scenery, it feels so small. 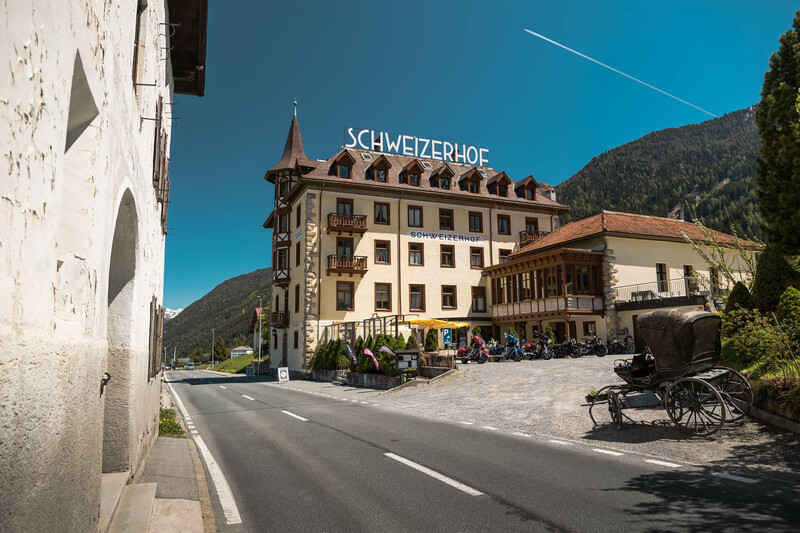 This large and traditionally Swiss guesthouse looks as if it could grace the front of a chocolate box but its owners (both completely bike mad) have more in mind than merely offering advice on local walks. 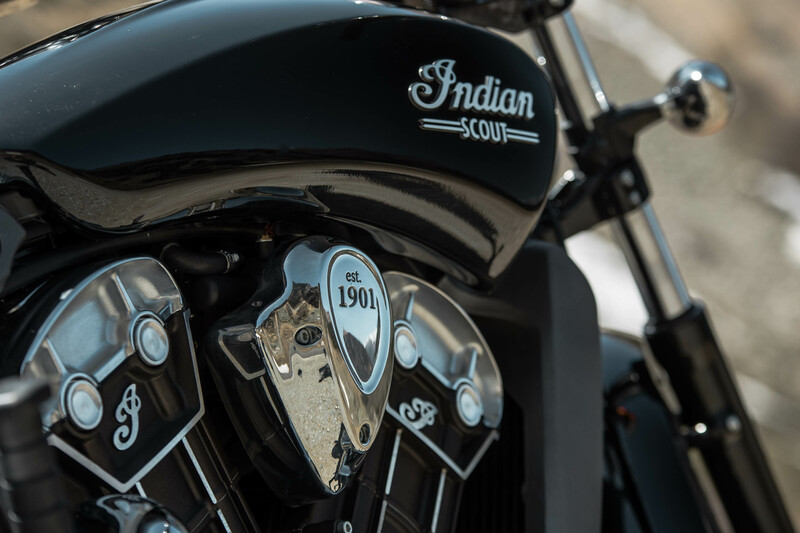 Teaming up with Indian Motorcycles, the hotels offers a wide array of models for rent by the hour, day or week. 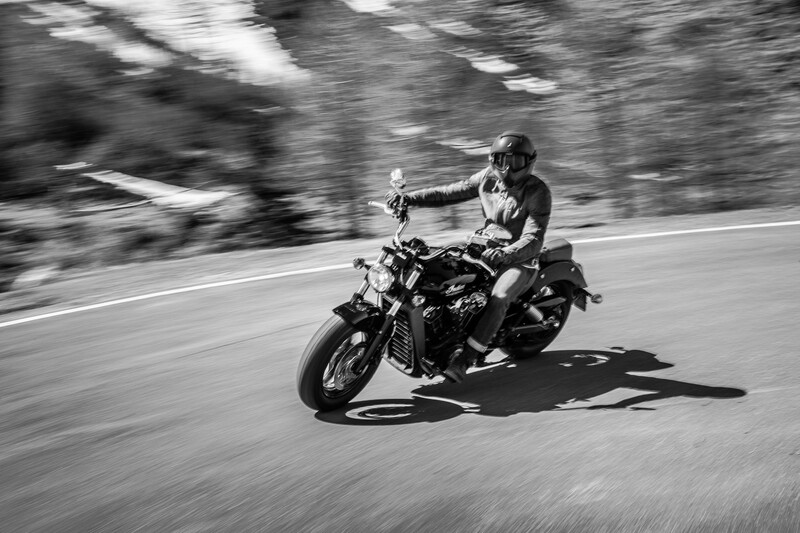 Alternatively, if the thought of two wheels doesn’t take your fancy, there’s the option to traverse the epic local passes aboard a Polaris Slingshot, which might just be the most fun you can have with your clothes on. Inside the hotel, there’s a warm and friendly atmosphere, with large rooms and great food foraged or sourced from farms and fields in the area. The summers in this part of Switzerland are particularly nice, so enjoying a frosty beer on the numerous terraces while watching the hordes of bikers buzz past is a great way to kill any down time. The trip begins in the picturesque and beautifully sleepy village of Santa Maria, which sits on the Swiss/Italian border to the east of country. 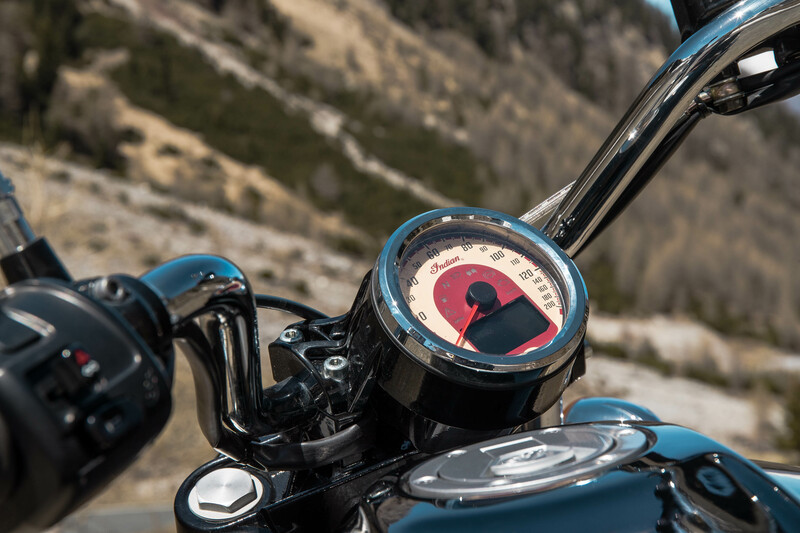 It is home to some of the fines motorcycling roads in Europe and acts as a gateway to one of the most famous road trip destinations known to human kind – the Stelvio Pass. 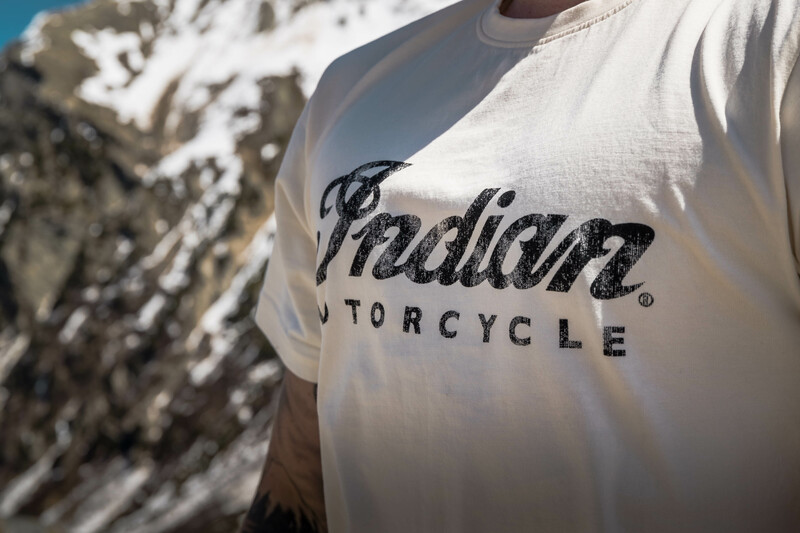 But we aren’t here to recreate every performance car magazine cover shoot in history, as we have been granted some exclusive access to some of the lesser-known mountain passes upon which to test the newest addition to Indian Motorcycles’ line-up. 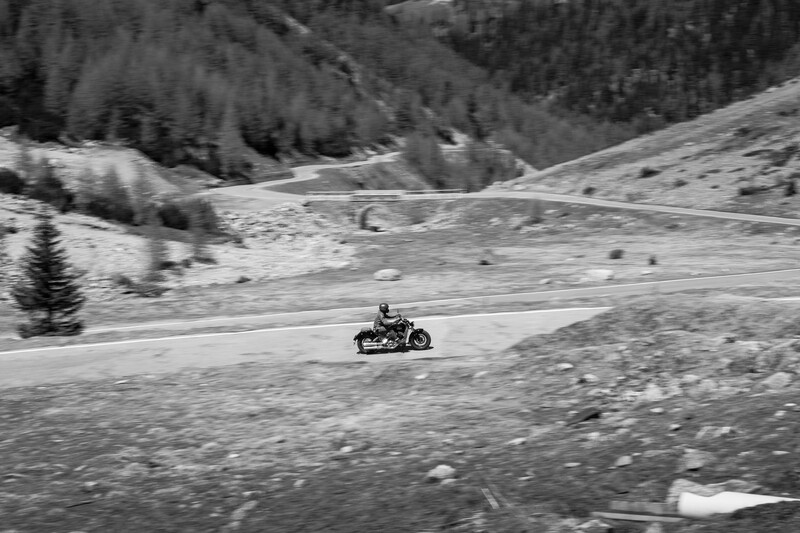 These zigzag roads, which rise up from behind the hotel, slash their way across the Piz Cotschen, rising to over 3,000m and eventually dropping into Italy and the infamous Stelvio Pass. Many of the local mountain routes remain closed for winter but the friendly owners of our hotel (see left) have somehow managed to gain access to this untapped Tarmac. Heroes. The low-slung, all-black machine that awaits me in the car park of the Scweizerhof Hotel crams a chunky 1130cc V-twin engine inside its surprisingly neat frame. 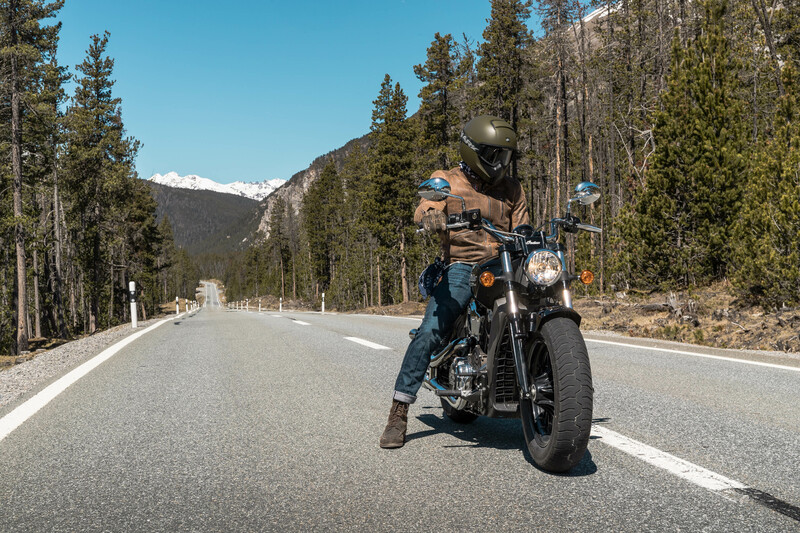 A 643mm seat height makes it incredibly easy to throw a leg over and the swept back bars instantly give a cosseting and approachable riding position. 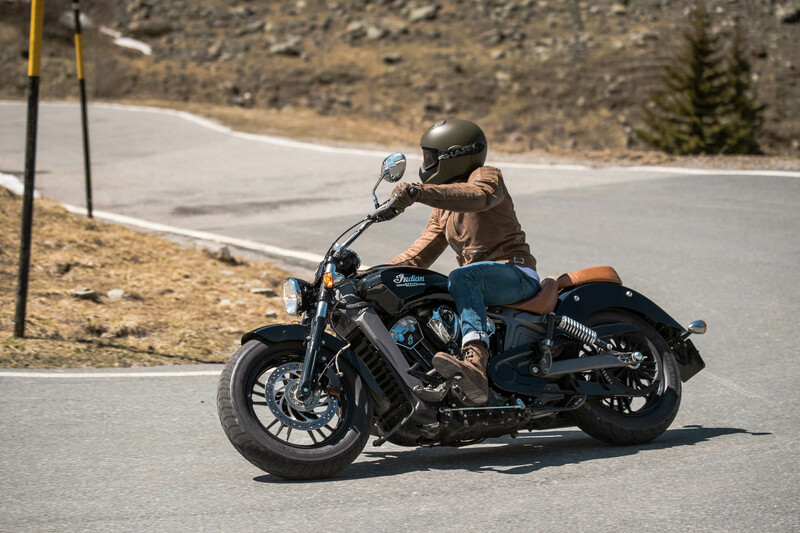 Of course, this bike is designed with customisation in mind from the outset and joins a long list of recent models from numerous manufacturers that aim to cash in on the current trend for everything retro, unique and ‘shed built’. Prices start at £10,799, so it’s a serious investment for anyone looking to add a personal flourish, but there’s a lot of bike underneath the rather basic exterior. The frame is fashioned from aluminium and has been assembled in a number of pieces to make working on the engine much easier. It also reduces overall weight to 247Kg, which is impressive given the thumping 100hp engine that drives the thing. 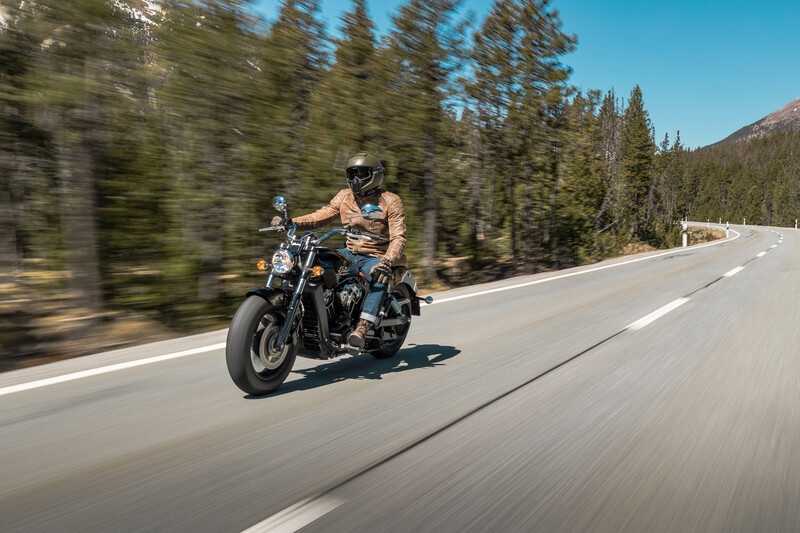 The Yankee powerplant revs freely and delivers its peak dollop of torque at 5,900rpm, actively encouraging the rider to uncharacteristically wring its neck. 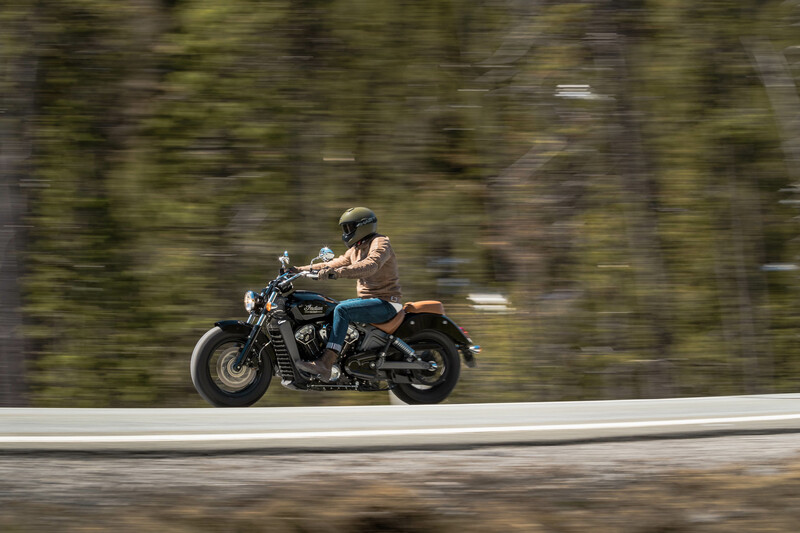 It takes just a few miles of sweeping Swiss bends to get comfortable on the Scout, its powerful brakes offering plenty of stopping power and that entertaining engine proving that showy cruisers needn’t be boring. I could probably draw you a map of the Umbrailpass from memory is you asked, simply because I ran that stretch of road so many times on the Scout, predominantly to bag the stunning photographs but chiefly because the route is so damn addictive. Lefts link into rights, which hook back into lefts that open up into long straights. Then it is hard on the brakes, steadying the machine, lining up the next corner and back on the throttle. Hypnotising, hazardous and hilarious at the same time. The Scout thunders along a road that splits two peaks, there is absolutely nothing for miles around except scenery – enormous, life-affirming scenery. Granted, some of the Scout’s switchgear feels a little cheap, there’s a distinct and slightly irritating lack of fuel gauge and the throttle could do with being a tad more responsive, but the foibles can be forgiven. Up here, where the air is thin and the clouds hover below, there couldn’t be a finer piece of machinery. I reach down and twist the stubby key in its ignition barrel located by my left leg. I thumb the starter switch and that big V-twin barks into life. 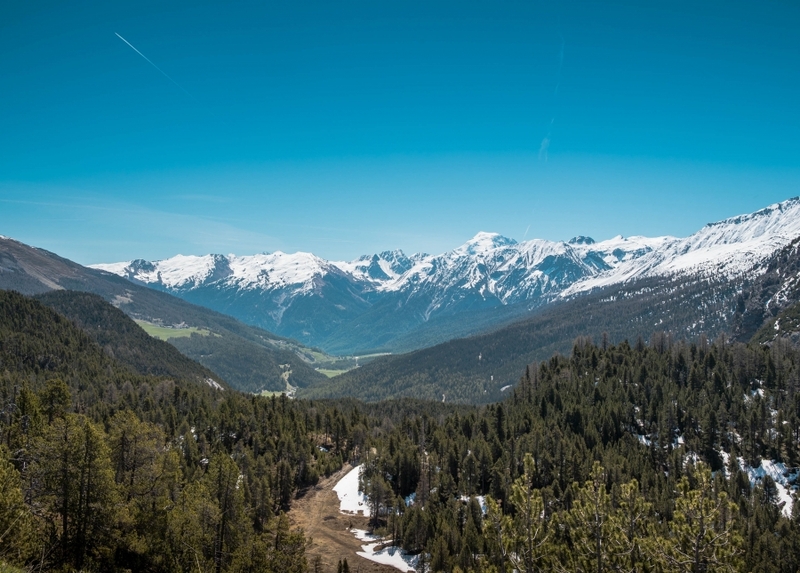 It’s time to leave the Umbrailpass behind and make a beeline for even bigger scenery. The roads that lead away from the Italian border get larger, wider and better sighted than those found on the tight mountain passes. 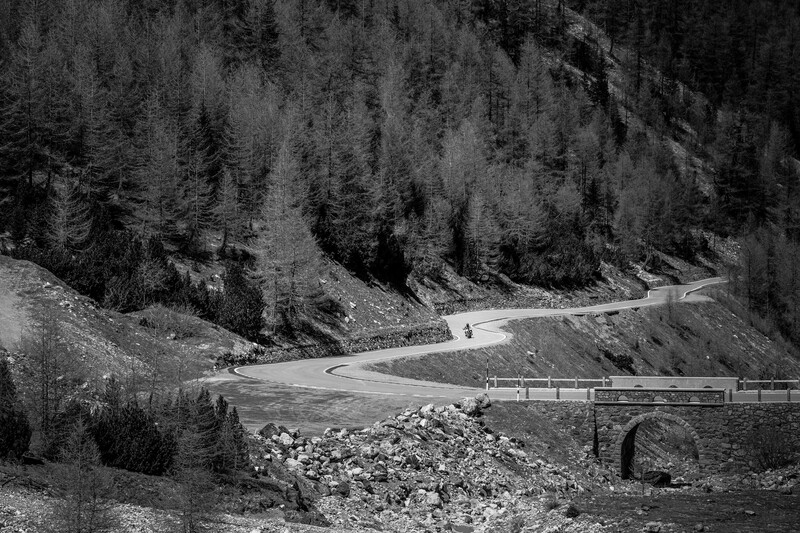 These perfectly paved routes hug crisp streams and crystal clear rivers, enormous pine trees bunch together in every direction and, occasionally, the Tarmac grips the side of a peak and winds its way this way and that, before cresting another mind-blowing summit. 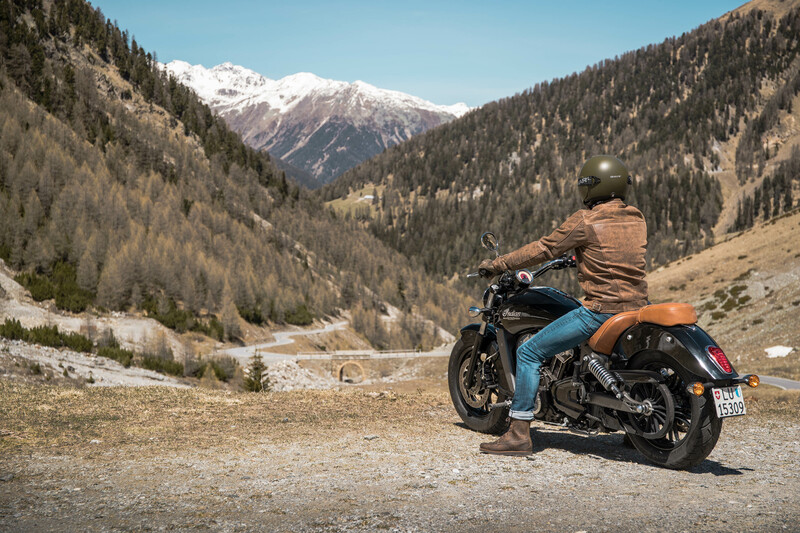 Take Route 28 towards the Parc Naziunal Svizzer and marvel at the surroundings as Switzerland does its best impression of Milwaukee or the Rocky Mountains.The Scout feels perfectly at home here, the front-set pegs and laid back riding position allowing me to drop a hand from the bars, lean back into the leather seat and take it all in. Occasionally, the route (and bike) urges the rider to press on and pass some of the slower moving holiday traffic. 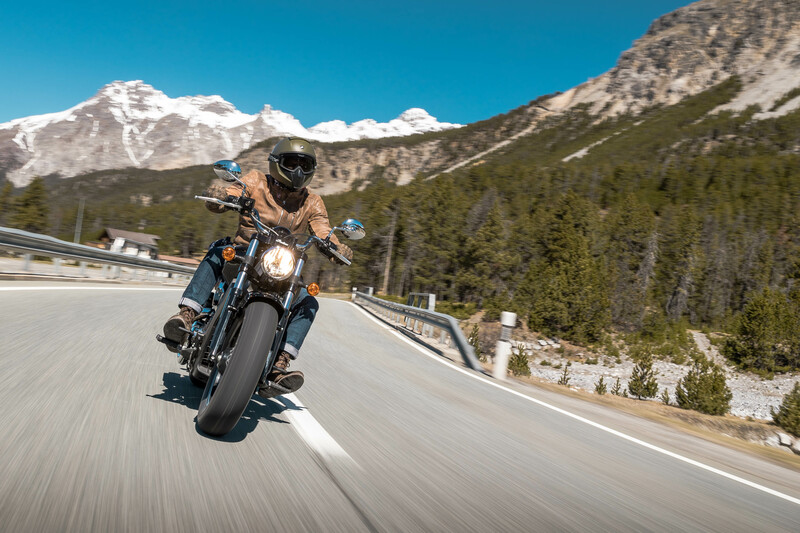 Throttle past the motorhomes, caravans and trucks and it is possible to ride flat-out for miles without seeing another vehicle. 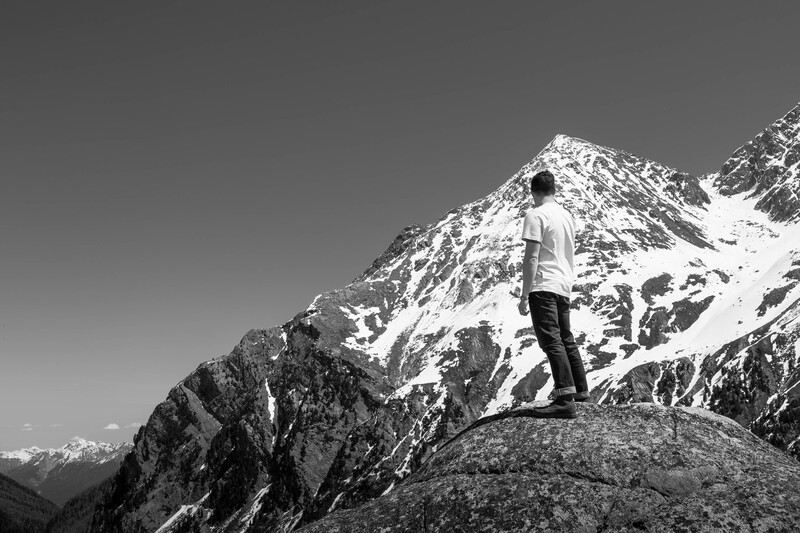 The Piz Nuna passes, as does the Piz d’Arpigilias until Route 28 turns into Route 27 and the Scout thunders on towards the deserted ski resort near Scuol. There is a cafe at the base of the mountain range that is popular with local and visiting bikers. It’s just off the main route and offers a much-needed toilet break and a warm cup of coffee to anyone passing through (although you have to spend a Euro to spend a penny here) – not to mention more excellent photo opportunities. Starting from the top, the Shark Vancore helmet (£249.99) with integrated goggles provides the all-important head protection. Jacket and gloves by Furygan, the rusted Coburn jacket (£379.99) complimented by matching James gloves (£69.99). 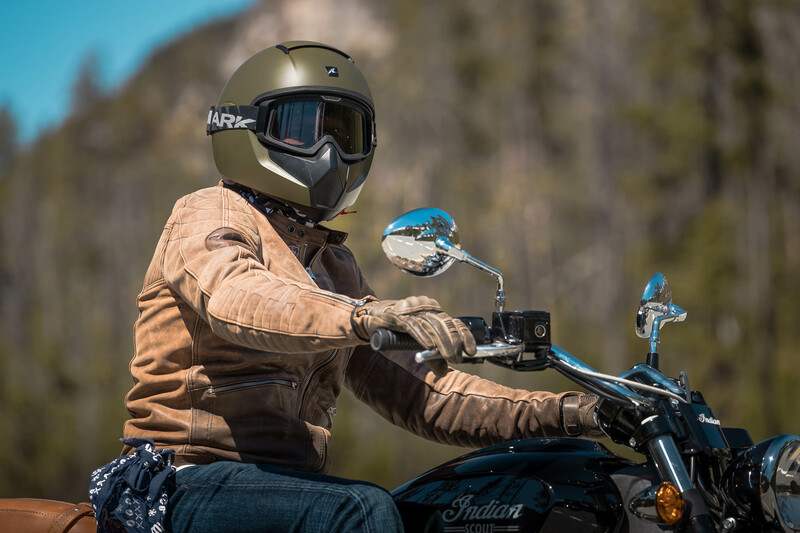 Although not deafeningly loud, Alpine MotoSafe (£19.95) earplugs brilliantly muffled the pipes of the Scout for a more comfortable long distance ride. These reusable plugs come in three different versions with varying attenuation levels to suit all bikes and riders. 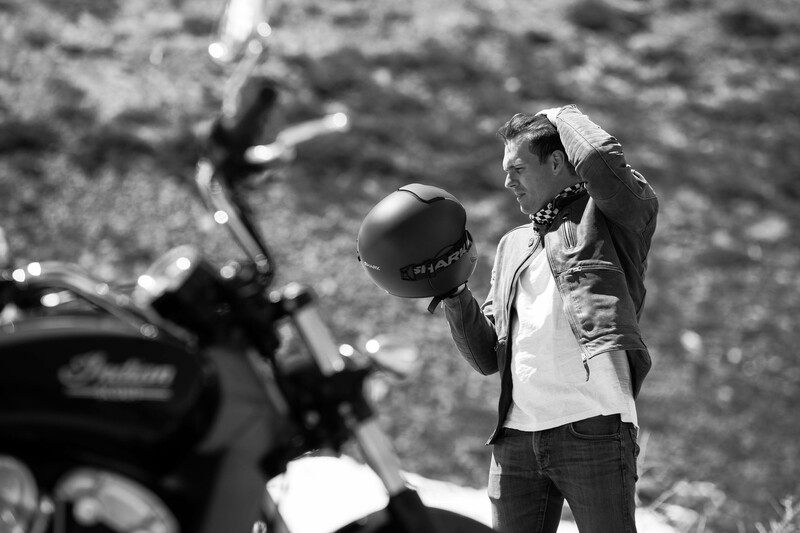 Boots provided by TCX (Nevis.uk.com), T-shirts by Indian Motorcycles, Deus Ex Machina, Sorted Surf Shop. Time is scant with the Scout and the nagging issue of a flight out of Zurich forces a U-turn back towards our original destination in Santa Maria. 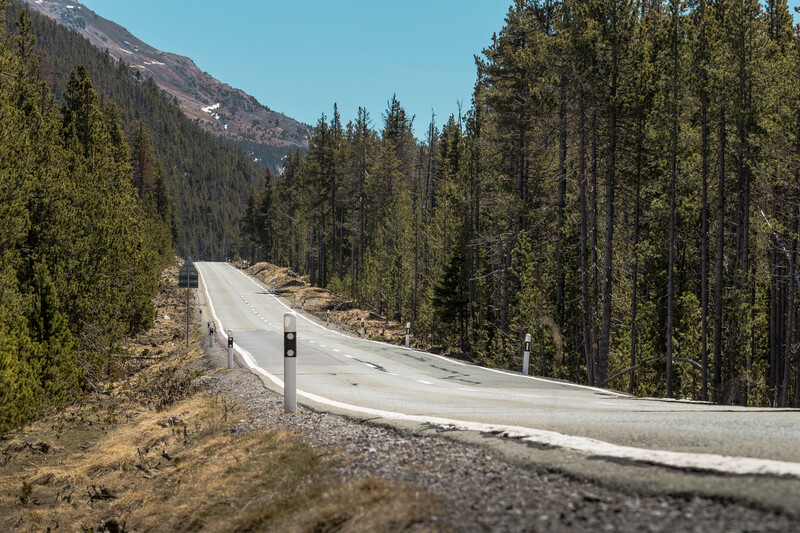 Although these mountains provide a suitably stunning backdrop, they make creating neat road-trip loops difficult, so I hit Route 27 and 28 head towards the famous ski resort of Klosters and Davos, until I eventually rejoin the 28 towards Santa Maria. Here, roads that have previously featured in numerous blockbuster movies are physically carved into mountainsides, with water from rapidly melting peaks tumbling down into deep ravines. 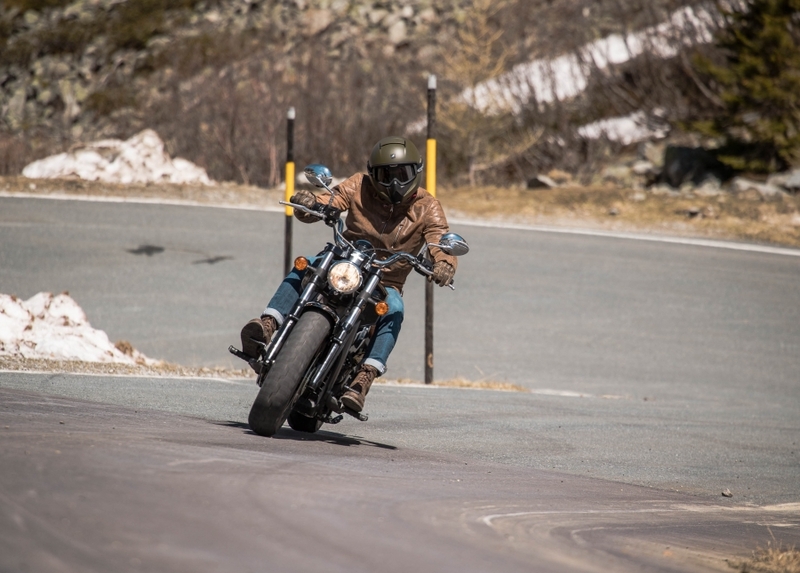 From Tschierv, it is a fast run towards the hotel, the deep bellow of the V-twin bouncing off the concrete walls of bridges and tunnel structures. Again, scenes that look like they have been lifted wholesale from Twin Peaks greet me, the Scout feeling more at home as the miles fly by. If there were such a thing as motorcycling nirvana, this would be pretty close.